‘Tis the season for being outdoors, and for enjoying it as much and as long as you can. Kicking back this summer means you’ll be sitting pretty—and quite comfortably—in these 10 outdoor loungers. 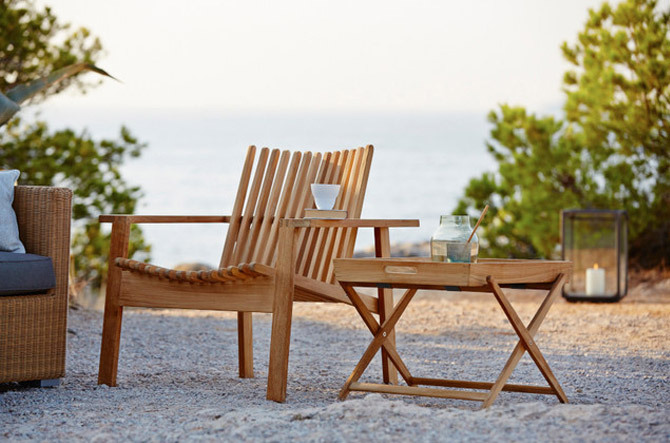 Known primarily for their all-weather wicker and outdoor upholstery, Cane-line takes a triumphant leap into the world of wood with this lovely chair made with solid teak slats. They are curved just so to cradle the body. With an angular, thick form made out of molded polyethylene and vinyl cushions, the Faz Lounge Chair is so coolly futuristic and comfortable, you’ll feel like the captain of a spaceship. It is, indeed, much more comfortable and supportive than it looks. 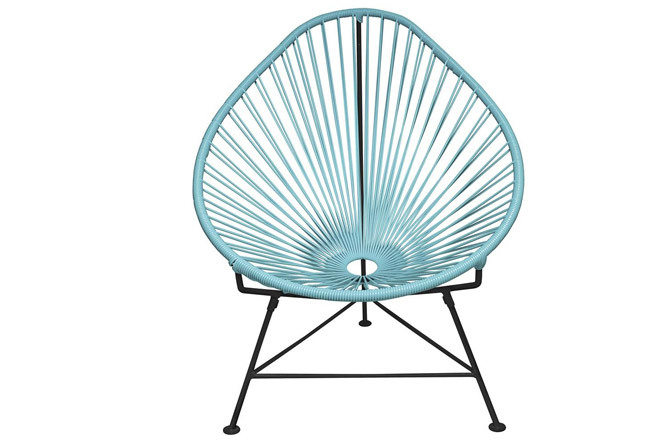 The Acapulco Chair remains just as it was when it was first designed in the 1950s with a nest-like seat woven out of strong and smooth vinyl yarns. Go ahead and try it; you’ll definitely like it. Another 1950s design, by Bjorn Hulten. With a minimum of components—teak and a single panel of Sunbrella or canvas fabric—the H55 Folding Lounge Chair provides remarkable and movable lounging wherever you need it. 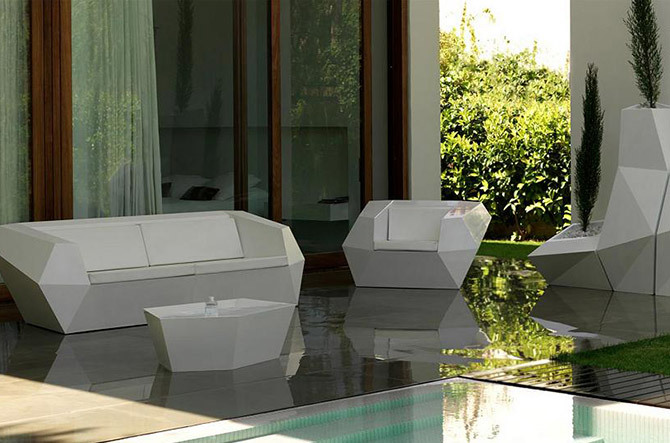 Before the Bubble Club collection by Kartell, outdoor furniture was pretty unsurprising. As envisioned by Philippe Starck, the Bubble Club Armchair has all the classic lines and curves of an indoor club chair, but is made out of very outdoor-friendly polyethylene. Surprising, indeed. As designed in 1943 by Jens Risom, the Risom Outdoor Lounge Chair was originally made with surplus parachute webbing and locally sourced wood. The war may be over, but the curvy comfort of the lounge remains. 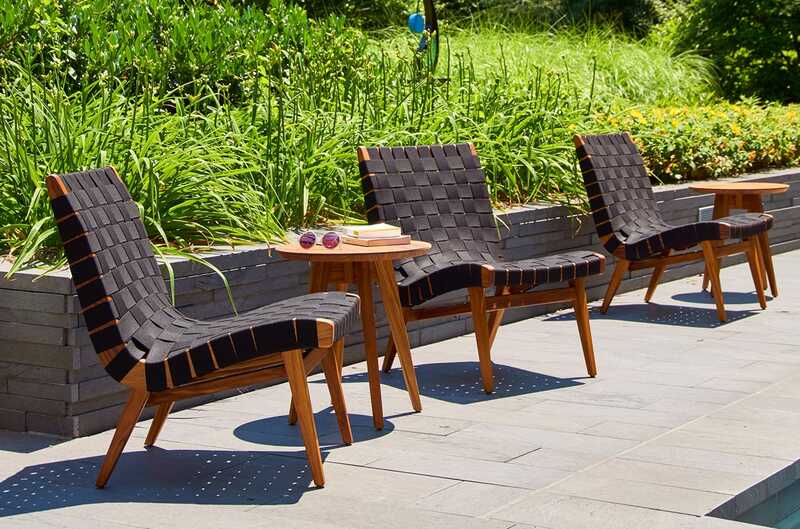 It is now made by Knoll with super-strong, flexible and weather-resistant Sunbrella straps and solid teak for long-lasting style on the patio or poolside. How do you really personalize an outdoor space? Put an actual face in it. 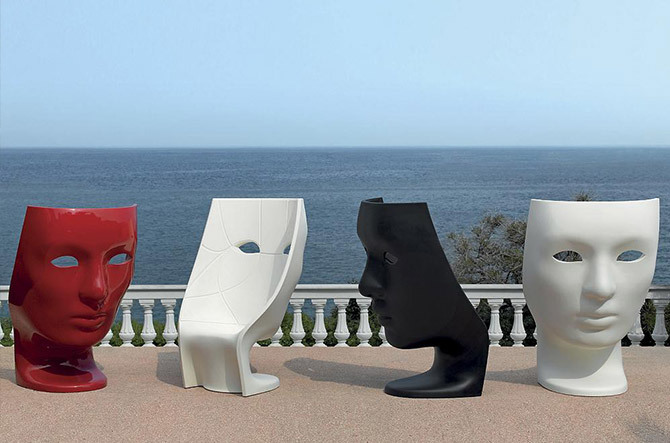 This is the signature piece for Driade, a lounge chair that is molded out of polyethylene to resemble an oversized mask. The curves of that mask create an unexpectedly comfortable seat. The Stripe collection is amongst the most popular by Mamagreen. This is likely due to the ideal combination of comfy cushions, colorful frame and contemporary form. 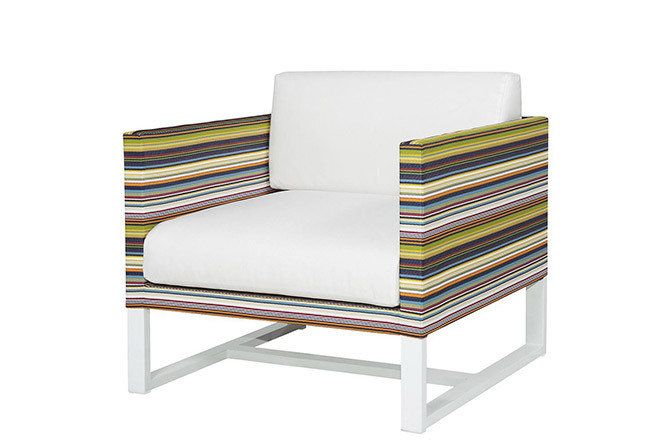 The main cushions are soft and weatherproof, as is also the vibrant Stripe fabric-covered frame. 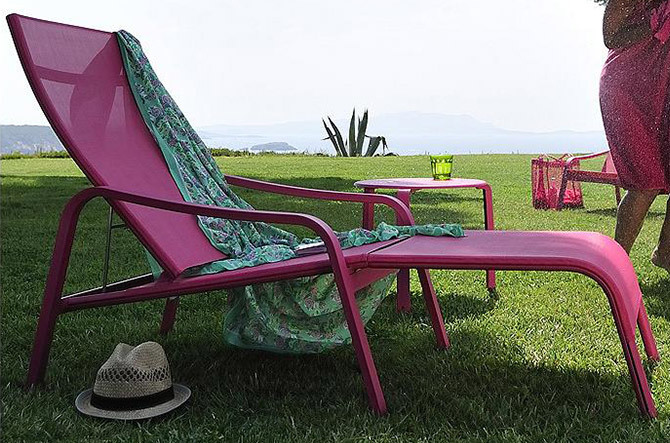 Known primarily for their brightly colored array of powder coated metal furniture, Fermob mixes it up here with their signature Outdoor Technical Fabric (OTF). 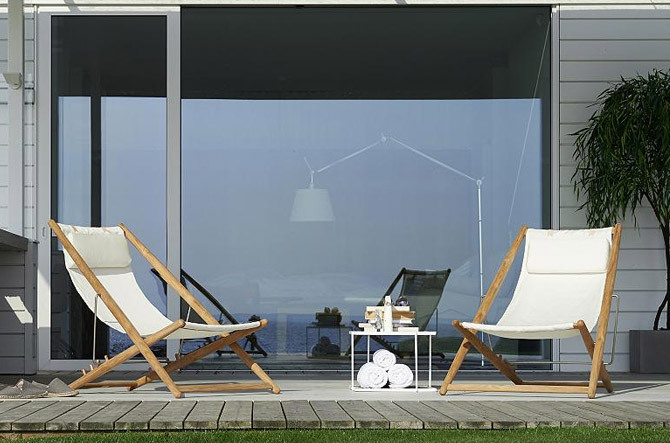 The Alize Adjustable Stacking Armchair is part armchair, part sun lounger and all you need for airy relaxation. 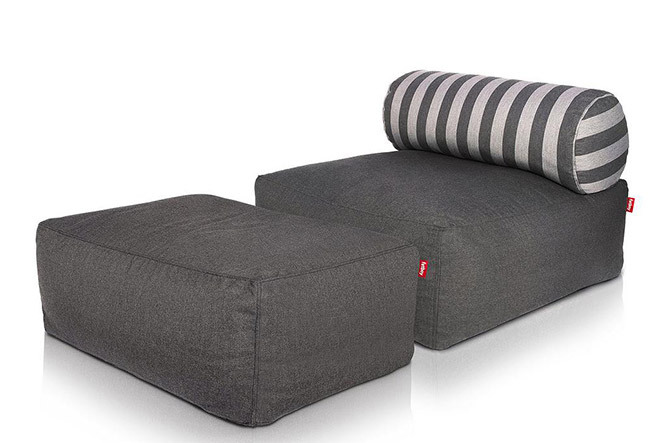 By reinventing the beanbag chair, Fatboy is already one of the cool kids. With the Tsjonge Lounge (and matching Jonge Ottoman), they add another sophisticated variation—which also happens to be weather resistant. 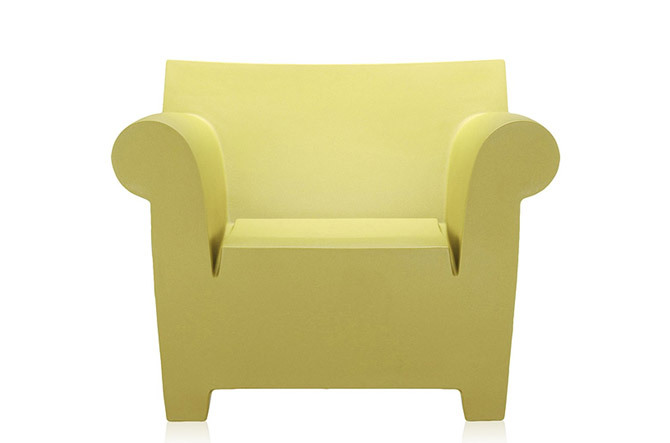 It comes in a wide array of seat and cushion/back colors.